Just how authentic can community-based tourism get? SaveAGram strives to raise the bar in not just capturing the authenticity of village tourism experience in the north and south of India, but also maintaining responsibility in touring activities so as to uphold age-old traditions, culture, values and even the architecture of Indian villages. By Mallika Naguran. SaveAGram's founder Amala Menon hopes to create genuine and authentic tourism experiences in Indian villages. SINGAPORE, 20 January 2018. SaveAGram grew from a pilot homestay project in rural Gaja village within the blue-green valleys of Garhwal, Uttarakhand in 2014. Amala Menon was impressed by the simplicity yet beauty of the village life there and put her calling to action, which was to preserve the cultural systems of traditional Indian villages. A year later, going south, Menon and her team guided the Koilery villagers in Wayanad of Kerala to welcome guests in their daily routine of milking cows, planting or harvesting vegetables, even trying their hand at cooking Indian food. A range of activities, from river rides on non-motorised wooden barges (zero carbon emission of course), a walk on the wildside with roaming elephants, to teaching children in schools open up new worlds in the eyes of tourists, particularly from first world countries. Confident that SaveAGram is on the right track, founder Amala Menon presses on to push the responsible tourism envelope by keeping all activities and interaction as genuine as possible, so that both guests and villagers benefit from tourism. 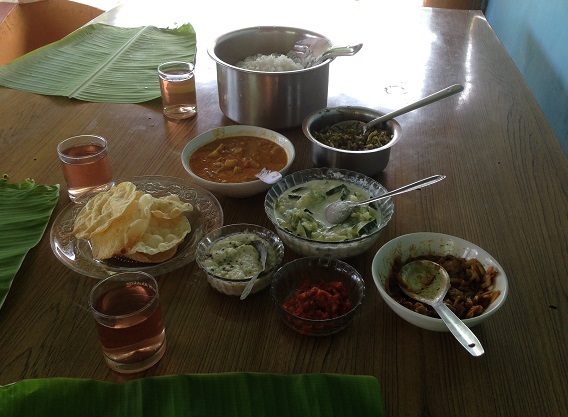 Gaia Discovery’s Mallika Naguran visits the founder Amala Menon in her Singapore apartment to find out about her motivations behind SaveAGram and her views about sustainable tourism. I understand that SaveAGram is a fairly new and small company offering tours to villages in India, but how is it different from most community based tours? Since the place is owned by the villager/farmer you get an authentic experience and not a contrived one. Most of the guiding is done by the farmer himself or by locals/tribes so that one gets again as authentic an experience as can be. I realise that mostly this is not common in community based tours also. It’s hard to even describe the difference until one visits, to be honest. Part of the learning experience with SaveAGram tours is the appreciation of building architecture and materials such as these village houses in India. The additional difference is that SaveAGram facilitates the experiences based on our own exposure and experience in travel around the world and what we would like to see. Most community tours are owned by those not from the community itself but who live there and do it mostly to earn a living for themselves with a trickle benefit of employment opportunities to the community. We do not own any of the property; it is still owned by the original owners of the land. Delectable South Indian food is offered to SaveAGram guests where vegetables and fruit are harvested from their own garden or local markets. The amazing natural beauty of rural India and slowly losing this to ugly new developments, together with visits to Europe and seeing how proud the Europeans were of their heritage made me want to do something to preserve rural India in terms of what was sustainable in heritage and architecture including farming methods and what would bring about self esteem for the villagers by methods including income generation. There was also a desire to help stem the migration to the cities from villages by providing alternate income streams in the villages. There was also an aim of doing something more meaningful in my life. What can tourists stand to gain from visiting the villages you are promoting? Wonderful insights into village life, nature, home-cooked food with most ingredients from the home owners’ farms, simple village lives, architecture of old village homes, real spring water, a chance to mingle with villagers and village children, a chance if they like to contribute to local schools and the area. And a real change from a resort or nice hotel! What elements of responsible tourism are important to you and in SaveAGram? 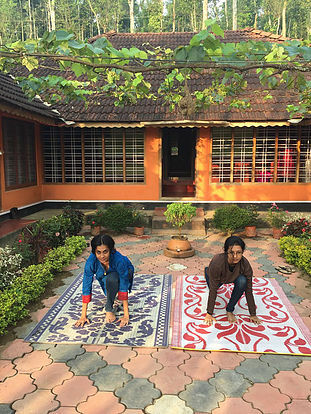 Yoga and other rejuvenating activities come easy with SaveAGram stays in India. Quite a number, and let me explain. First, it would be ensuring that the environment is not taxed in terms of resources used or waste generated. And promoting sustainable farming and architectural methods. Food consumed is locally and sustainably farmed using natural methods. We aim in our tours to give back to the village ecosystem to help it sustain environmentally and agriculturally, and yet grow economically. There is low or no usage of plastics whatsoever. I think in responsible tourism we would need to encourage recycling in the villages so as to make villagers aware of the potentials in re-using and recycling resources. SaveAGram encourages guests to interact with school children in village schools of India so as to raise their awareness of what goes on in the world if not to teach them something new. From the social perspective, we encourage the tourists to visit the local schools and spend time with the children in teaching them some skills or just talking to them about where they come from. Essentially it is not about providing employment but about empowering the locals through tourism and sustainable agriculture. We request that tourists visiting these homestays should respect the villagers’ ways and homes and not impose in anyway and not be noisy. What are a few challenges faced in running SaveaGram and how are you looking to overcome them? Maneuvering through the Indian bureaucracy and choosing or finding the right people to work with. All photos courtesy of SaveAGram.